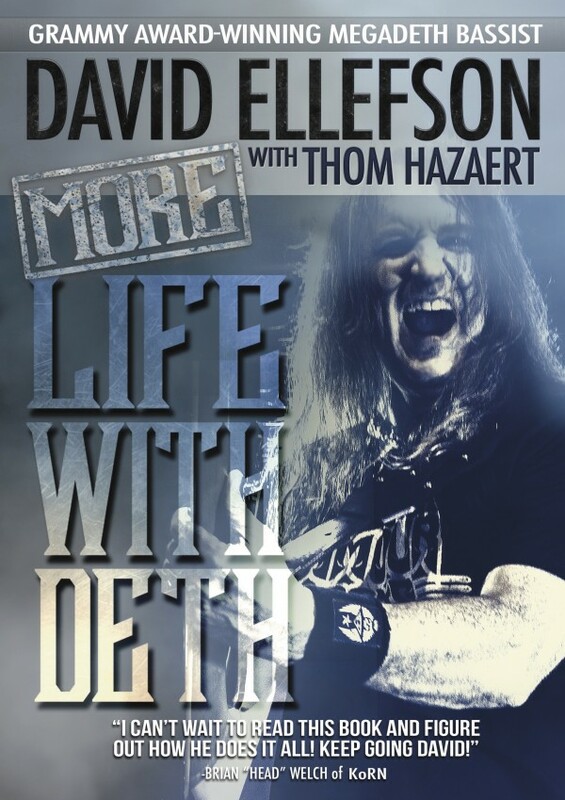 In this follow-up to his 2013 memoir My Life With Deth, Megadeth bassist and co-founder David Ellefson carries on where he left off, charting his mid-2000s departure from Megadeth through his triumphant return in 2010, and offering an inside look at the continuing saga of one of the world’s biggest and most enduring heavy-metal bands. Co-written with his business partner, Thom Hazaert – a celebrated music-industry figure, radio personality, and music journalist – More Life With Deth chronicles Megadeth’s record-shattering ‘Big Four’ shows alongside Metallica, Slayer, and Anthrax, and the release of their Grammy-winning Dystopia – their highest-charting record in over twenty-five years – and the massive two-year world tour supporting it. Far more than your typical rock star tell-all, More Life also delves deeper into the origins of Megadeth and David’s roots in rural Minnesota, and tells the stories behind the creation of his hugely successful EMP Label Group, Ellefson Coffee Co., and the relaunch of the famed metal label Combat Records, as well as his continued personal journey of spirituality and sobriety. Told through the words of Ellefson, Hazaert, and friends including Alice Cooper, Brian ‘Head’ Welch (Korn), Kristian Nairn (Game Of Thrones), Mark Tremonti, K.K. Downing (Judas Priest), Brian Slagel (Metal Blade Records), Frank Bello (Anthrax), Jason McMaster (Dangerous Toys), Dirk Verbeuren (Megadeth), Kiko Loureiro (Megadeth), Chris Adler (Lamb Of God, Megadeth), Dan Donegan (Disturbed), and many more, More Life With Deth is an insightful and personal look at one of the most revered rock musicians – and preeminent heavy-metal entrepreneurs – of our time. From humble farm roots in Jackson, Minnesota, David Ellefson went on to become the bassist and co-founder of Grammy-winning thrash titans Megadeth, a member of the metal collective known as the Big 4, alongside Metallica, Slayer, and Anthrax. Megadeth have sold over thirty million albums worldwide during their storied thirty-five-year career. Ellefson is also an accomplished author, producer, clinician, music-business lecturer, and entrepreneur, presiding over a global brand portfolio, including his own record labels EMP Label Group and Combat Records, as well as his global coffee shingle, Ellefson Coffee Co. His literary works include the music-business self-help guide Making Music Your Business … A Guide for Young Musicians (Hal Leonard) and My Life With Deth (Howard Books/Simon & Schuster), which was co-written with Bass Player editor Joel McIver. Born in 1975 in Green Bay, Wisconsin, Thom Hazaert is a celebrated music journalist, radio personality, music and film producer, artist manager, and A&R and marketing executive, known for his pioneering work in the world of lifestyle hard-rock marketing for gold and platinum artists including Limp Bizkit, Staind, Coal Chamber, Static-X, Incubus, and many more, as well as his own record labels, Corporate Punishment Records and THC Music, which have released music from artists including Primer 55, American Head Charge, Chuck Mosley, Malfunkshun, Ghost Machine, Switched, and more. In 2015, Hazaert became the head of A&R and operations for David Ellefson’s fledgling EMP Label Group, later spearheading the relaunch of storied metal label Combat Records. Hazaert is also a partner in Ellefson’s hugely successful coffee brand, Ellefson Coffee Co., and the marketing braun behind Ellefson’s powerhouse umbrella of international brands.